The author of the best-selling book The Happiness Equation wasn’t always as cheerful as he is now. Neil Pasricha started his daily blog, 1000 Awesome Things, as a form of therapy after going through a painful divorce and having his close friend kill himself. The end results was The Book of Awesome, a collection of some of Pasricha’s blog posts, which he wrote as a way to “try and put a smile on my face before I went to bed every night.” It included the joy of finding $5 unexpectedly in a pocket, being called up to the dinner buffer first at a wedding, and much more. “When I started living the small pleasures I found myself getting happier,” Pasricha said. Shortly after marrying his new wife she became pregnant, and Pasricha started writing a letter to his unborn son. 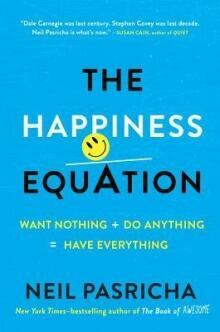 Three hundred pages later, that turned into his new book, The Happiness Equation. Pasricha joined guest host Michelle Eliot on B.C. Almanac to share some of his formula for being happy. “My parents are immigrants. They said work really hard, then have a big success, then you’ll be happy. It’s study hard, get good grades, be happy later,” Pasricha said. “The research suggests that if you perform five random acts of kindness a week then you will be happier,” Pasricha said. He said buying a coffee for someone else, or holding open the door makes people feel good about themselves. “We spent 300,000 years as a species evolving these incredible minds to look for problems, find problems, and solve problems,” Pasricha said. Another important part of the happiness equation is “remembering the lottery,” Pasricha said. “Fourteen out of every 15 people who have ever lived are no longer here. You get to be one in 15 that gets to see another sunset, kiss their kids goodnight, or have another bowl of chocolate ice cream,” he said. “On top of that we’ve got the odds of being in Canada, 35 million out of seven billion. That’s a one in 200 chance of being in this great country. If you make more than $5,000 a year, you have more than the average world income.